This Sunday night at 7:30 pm (CT) the Oakland Raiders will travel to Washington D.C. to take on the Redskins. Both teams will be riding high after high scoring victories, and this game is shaping up to be another high scoring game. 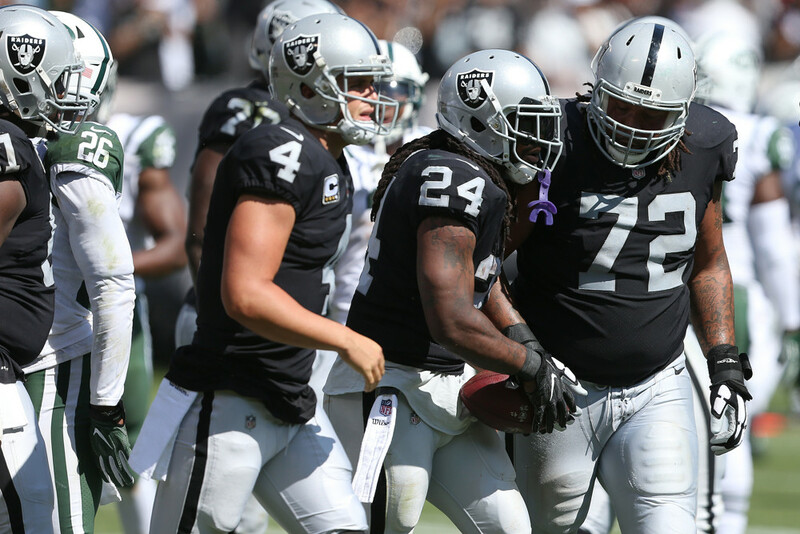 In Week 2, the Raiders put up 45 points against the hapless Jets’ defense, and Washington managed 27 points against a solid Rams’ defense. These two teams have not met since 2013, when Terrelle Pryor was actually a quarterback for Oakland and Kirk Cousins was just a backup to Robert Griffin III. Things have come a long way for both teams since then, and this game should be another good offensive battle. Derek Carr threw for 23 completions on 28 attempts for 230 yards and 3 touchdowns last week against the Jets. So far this season Carr has accurate and efficient, totaling 5 touchdowns and 0 interceptions. The Redskins’ defense ranks 17th in points given up to QBs, so Carr shouldn’t have too hard of a time throwing the ball. With a dynamic duo of WRs, Carr should be a middle to low end QB1 in this matchup. Marshawn Lynch has been impressive so far this season, especially after coming off 1 year of injury followed by 1 year of retirement. Lynch is rushing for 4.0 ypc, and seems to be having fun once again. This week Lynch is up against the 26th ranked Redskins’ defense in points allowed to running backs. With the Redskins having to watch out for the Oakland WRs, look for Lynch to have plenty of opportunity in this one. He is a lower end RB1. Amari Cooper will have a tough matchup in Week 3, slated to see a lot of shutdown CB Josh Norman. Josh Norman has a history of getting under the WR1’s skin, and this week should be no different. The Redskins’ defense as a whole ranks 11th in points given up to WRs, so they have been pretty solid so far this year. Cooper also had a quiet game against the Rams last week, catching just 4 passes for 33 yards. Amari will still be started in most leagues, but will probably be a higher end WR2 in this tough matchup. Michael Crabtree exploded in Week 2 against the Rams, catching 6 passes for 80 yards and 3 touchdowns. Crabtree probably won’t repeat this against a better Redskins’ defense, but with Cooper seeing a lot of Josh Norman, Derek Carr may have to target Crabtree more often if they want to move the ball downfield. Crabtree is looking like a middle WR2 in this one. Jared Cook has been targeted a total of 11 times this season, catching 9 of those targets for a total of 81 yards. The Redskins currently rank 25th in points given up to TEs in 2017, allowing 93 yards to Zach Ertz in Week 1 and 95 yards to rookie Gerald Everett in Week 2. With Cooper and Crabtree facing a tough group of cornerbacks, look for QB Derek Carr to target Cook a little more often in this game. Cook is an interesting streaming option in this one, and should be a middle TE2. Kirk Cousins has had a pretty quiet season so far in 2017, completing just 61.2% of his passes for 419 yards, 2 touchdown, and 1 interception. This game doesn’t appear to be too much easier for Cousins, who will see the 18th ranked Raiders’ defense in points allowed to QBs. Since the Raiders’ have a high powered passing offense, and stronger rushing defense, Cousins may have to throw a bit more often in this one. He will be a high end QB2. With the injury news to Rob Kelley (rib cartilage), Samaje Perine will be in line to take over the 1st and 2nd down rushing responsibilities. Perine rushed 21 times for 67 yards and caught 1 pass for no gain in Week 2 after Kelley’s exit. If Kelley does sit, Perine will be up against the 6th ranked Oakland defense for points allowed to running backs. Perine can catch the ball, so he may see some targets, but Perine shouldn’t be more than a RB3/Flex option. Rob Kelley was slashing through the Rams defense in Week 2 before he exited with injury. Kelley had rushed 12 times for 78 yards. If Kelley can go in Week 3, he may be wearing a flak jacket to protect his injured ribs. Injured and in a tough matchup, Kelley is merely a Flex option unless he is 100% by Sunday night. If he is 100%, he may have the volume to be a lower end RB2. Chris Thompson is coming off a great game against the Rams, rushing 3 times for 77 yards and 2 touchdowns and adding 3 receptions on 7 targets for 29 yards. Thompson should see a few more carries if Kelley sits, and if Washington falls behind early they will look to throw. Thompson could easily see 7 more targets in this game. He is an interesting Flex play in Week 3, especially in PPR leagues. Terrelle Pryor and Jamison Crowder have been pretty awful for fantasy so far this season, but this Week 3 matchup may be what they need to break out. The Raiders have an 18th ranked defense in points allowed to WRs, so they are beatable. If Oakland gets out to a good lead early, Cousins will have to throw. That being said, the Redskins’ WRs have been underwhelming so far. Terrelle Pryor has a total of 8 receptions for 97 yards and Crowder has 7 receptions for 61 yards in two games. The opportunity is there since Cousins targets them often (Pryor-15 targets, Crowder – 11 targets), but so far they have nothing big to show for it. If Reed does sit, both Pryor and Crowder should see a few extra targets. Either way Pryor looks to be a WR2 and Crowder is more a WR3. Jordan Reed left Week 2 with a chest injury, which can be added to his broken toe and myriad of concussions. And yet Jordan Reed continues to be a beast and the main target for the offense. Reed hasn’t been amazing so far this season, and is up against an 8th ranked defense in points allowed to TEs. If Reed does play, and he probably will, he will see plenty of targets and is a must start. No news has come out yet on the seriousness of the injury, so watch carefully and be ready to pick up a streaming TE. If Reed does play, he should safely be a TE1.